In a fantasy world ravaged by invading Fire Elementals, humans struggle to survive. Every year, the fire elementals burn and consume, driving back the human settlements. The strength of man is failing. Only a few strongholds remain. When Ketyl comes across signs of scouting portals, he realizes the elementals have discovered the Fortress. As Ketyl and his brother Karvir summon the remaining militias to the defense of the Fortress in a last stand against the elementals, a young boy flees his home with his pregnant step-mother. His father has died fighting the elementals, and it is no longer safe at their farm. The forces of men prepare for their final battle when Ketyl comes across a vital piece of information. He has a plan to end the war. It maybe folly. It may be suicidal. But what choice do they have? 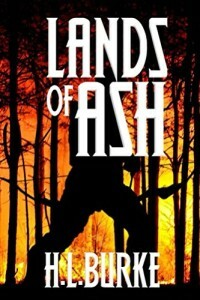 Lands of Ash was a surprising book. When I first came across this book, I was intrigued by the premise. The story seemed very predictable, the characters familiar, but H.L. Burke packs surprising twists and powerful moments between her characters. I couldn’t put the second half of the book down and I can’t wait for the sequel to come out next year. Any fan of good, imaginative fantasy will love Lands of Ash. H.L. Burke is a wife of a soldier, and her experience comes through, particularly with Karvir’s wife and daughters. Strong characters, magic, danger, and heart-pounding action is painted across the pages of this fantastic book. You can buy Lands of Ash from Amazon!